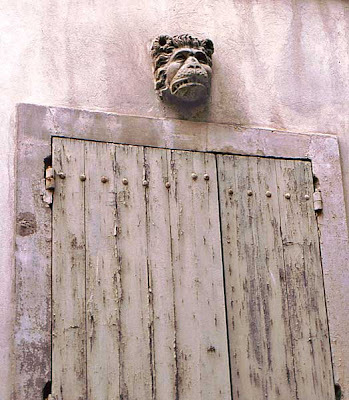 The second time we visited Cahors was in 1995 (the first was in 1989). This time we found our way up to an overlook on a bluff across the river and took some photos of the city from up there. 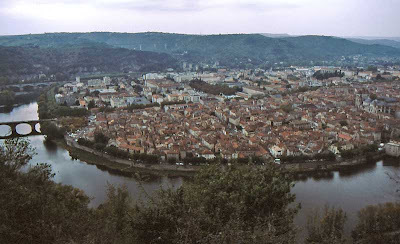 The center of Cahors on the Lot River. 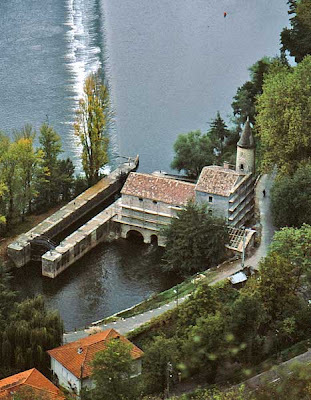 Cahors is built in a loop or meander of the Lot River, called a boucle in French (boucle = curl or buckle). The city was a prosperous commercial and educational center in the middle ages, and the Knights Templar established themselves there for a while. 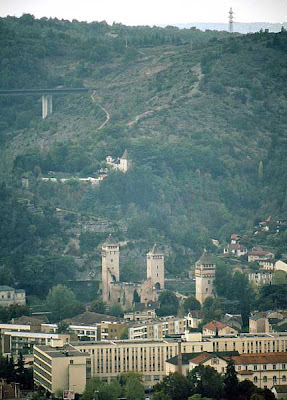 The towers of the Pont Valentré rise up over the western edge of town. The city's most famous monument is probably the Pont Valentré, a fourteenth century towered bridge with a legendary history. I posted a brief résumé of the legend here, along with a better photo of the bridge that I took in 1989. A spillway and lock (écluse) on the eastern bend of the Lot. Cahors is also famous for something else: its red wine. The Romans brought wine grapes to the Quercy region over two thousand years ago. Later, in the middle ages, Eleanor of Aquitane and Henry II Plantagenet favored Cahors wine in their court. The English, apparently, dubbed the wine "black" due to its dark color and rich taste. The primary varietal in Cahors is côt noir, also called auxerrois. The same grape is known as malbec in Bordeaux and simply côt here in the Touraine region. A.O.C. wines in Cahors must contain at least seventy percent côt. You can find Cahors in many wine shops in the USA. I like it, and if you like tannic reds, you might, too. 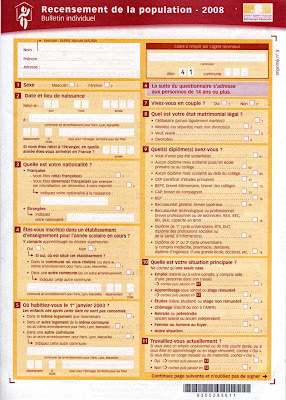 This is the first census that I've participated in here in France. One of our neighbors, who happens to be the wife of one of guys that owns the vines out behind our house, stopped by the other day with the census forms. She was really nice and explained what we were supposed to do. This is part of the personal info form. 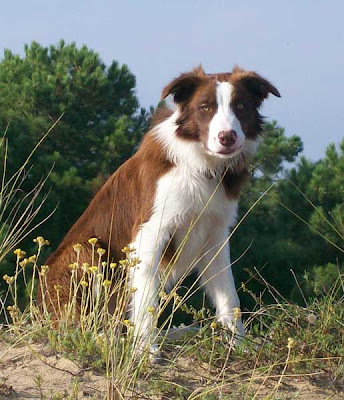 She knew us by sight, of course, because we've seen each other out in the vineyards, and she even knew Callie by name! Don't you just love that small town stuff? Well, some of it, anyway? So these are examples of the forms that we're asked to complete. One is about our property (kind of house, size, number of rooms, how it's heated, when it was built, etc.) and the other is about the people that live here (us). Of course, they're in French and I'm not going to translate them here. 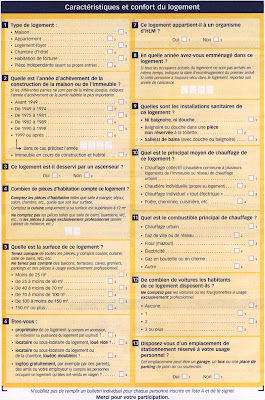 If you read French and want to look, click on the form for a larger view. This one's about the house itself. I don't see anything particularly personal in any of this so I have no qualms about completing the census, which is obligatory by law, apparently. The government already knows much more about us than this by virtue of the annual residency permit renewal process. 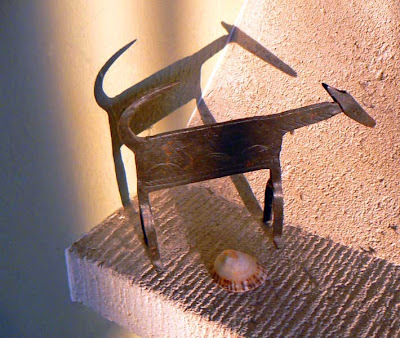 A metal sculpture of a dog, and a little shell. It's yet another reminder of lengthening days and the approaching spring. Hey, we take 'em where we can get 'em! Speaking of the moving sun, I've noticed that I can see Mars after sunset these days, right above Orion in the southeastern sky. I've been searching for Gemini, but it hides behind the trees until after I've gone to bed. Saturn rises then, and the moon comes out to play. In 1995, Ken and I spent a couple of weeks in the Lot Valley in southwestern France. Le Lot is a river roughly parallel to, and south of, the Dordogne. Very close to the town of Fumel on the Lot, and kind of lost in the hills to its north, is the medieval fortress of Bonaguil. The Château de Bonaguil see from across a small valley. As I am with Roman ruins, I'm a sucker for a good medieval castle. 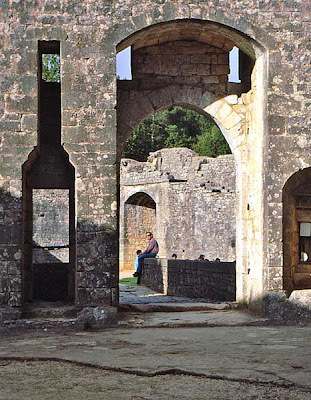 And Bonaguil is an amazing, nearly intact, example of late fifteenth/early sixteenth century military architecture. It's pretty much what I imagine when I think "medieval castle." Rooms and towers are ready for exploration. 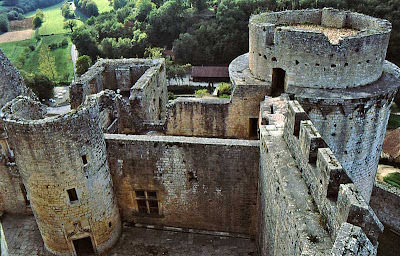 You clan climb around inside, outside, and even under this impressive château-fort. The lord's residence is intact and visitors can crawl around the various rooms and gawk at the huge fireplaces. Most of the rooms are open to the elements. There is no furniture or other appointments, mostly just bare stone. But your imagination fills in the blanks most readily. 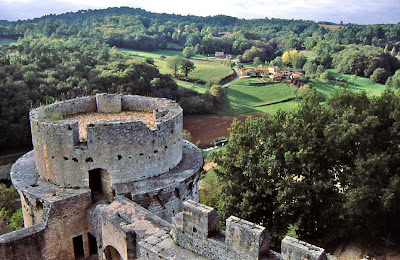 The surrounding countryside can be seen from the donjon tower. From the high tower of the donjon keep to the damp, dank passages beneath the courtyard, you can almost see and hear knights and knaves and peasants and prisoners in this place. It's way cool. 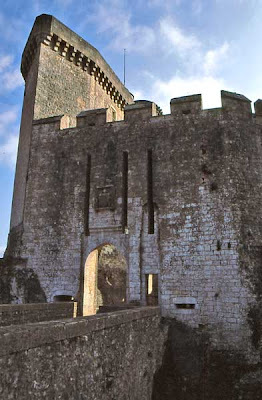 The donjon, or keep, towers up above the central courtyard. 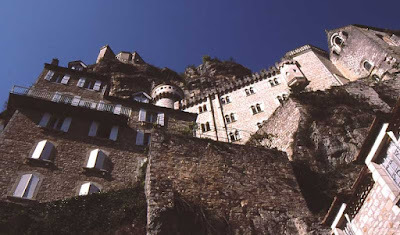 If castles are your thing, or even if they're not, this is a good one. You can see it in an hour or spend more time if you like. If you're in the region, it's worth seeking out Bonaguil. And, there's a town nearby for food and stuff! Ken sits on the wall of the bridge over the moat between the castle's inner and outer walls. 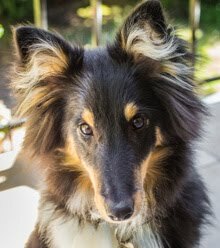 The breeder at the kennel where Callie was born has a website that includes a photo album of dogs that were bred there. Many months ago, Ken sent them a photo of Callie for the site. 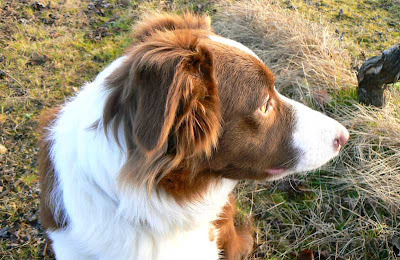 The breeder added the photo pretty quickly. I took a fresh look at the site a few days ago and noticed photos of what are certainly two of Callie's brothers! The breeder told us that Callie's brothers picked on her a lot. Chester certainly looks like a little bully in this photo, but Clay doesn't. 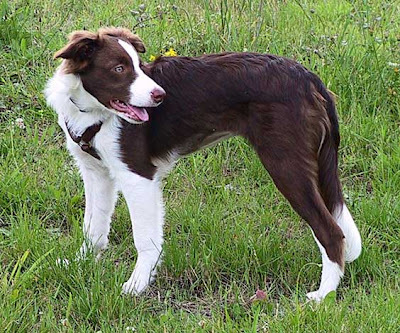 Of course, Callie was one of eight or nine pups in the litter, so we can't be sure these two are among the culprits. What gets me about this place is its verticality. I suppose that's what gets everyone about this place, but I can't speak for everyone. Yes, the main street is pretty flat, but it's the only street in town, and everything is either on it, above it, or below it. Rocamadour clings to the cliffs in the gorges of the Alzou. There's an old (1982 !) 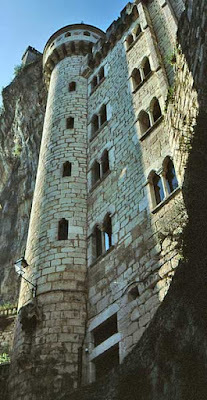 French song by Gérard Blanchard about Rocamadour. "My love has gone with a wolf into the caves of Rocamadour," it goes. "Mon amour est partie avec un loup dans les grottes de Rock Amadour." It's a frenzy of a song. "Elle est si jolie..."
The town legend is that, in the caves on the cliff side, Saint Amadour, previously known by the name Zachée, took refuge from the world, being a hermit and all. He liked the rocks. 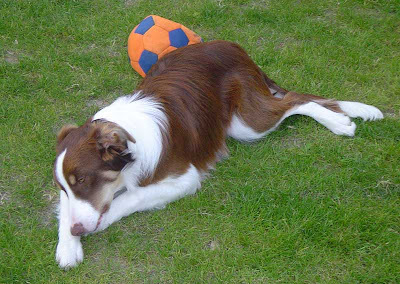 He was a liker of rocks, sort of a rock amateur. Roc amator. Roc Amadour. Rocamadour. You can see how it goes. Occitane morphs into French, right before your eyes. Since then all manner of religious construction has taken place around the cave-spot, and these buildings on the cliff are the result. I've been there a few times, or at least a couple. It's a fun place to visit, but not in the summer. 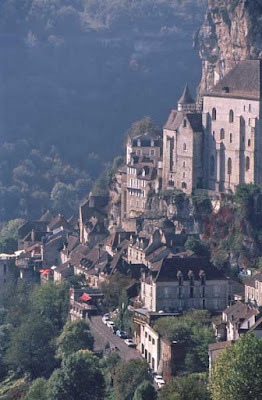 Summer is when everyone, and his brother, likes to visit Rocamadour. The town is kitsch shop after kitsch shop, interspersed with overpriced eateries. And you have to fight sweaty tourists along the way. We've had a lot of rain this month. Much more than average, in fact. Everything outdoors is a muddy mess. Walking on the ground feels like walking on wet sponges. Callie comes back from every walk covered in wet sand. We toss her in the shower in our utility room and hose her down twice a day. And dry her off. Twice a day. 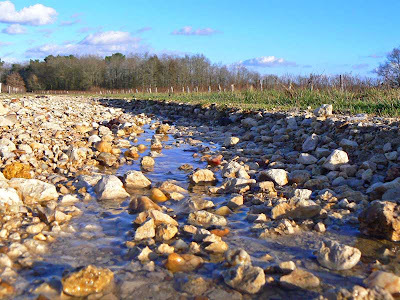 One of the gullies that formed in the vineyard road out back. The guy that owns the vines out behind our house came by in a tractor last week to dump crushed stone into some of the gullies that were carved by the rain runoff. He left deep tread marks outside our back gate. Where there used to be grass, there is now mud. On the upside, the temperatures have warmed up. We're using less heating oil and having fewer fires. The birds are singing up a storm out there. Bulbs are pushing up and buds are fattening. I was able to get outdoors yesterday morning and accomplished the following: pruned the last rose bush, pruned our ten or so grape vines, cut the suckers (some were about six feet high) out from beneath four of our twelve hazelnut trees and stacked the cuttings, pruned the hydrangea, and trimmed back the sage plants. There is still much more to do, but there is time. Just being in the sunshine doing some yard work made me feel good. And Callie had a good time running around and dragging sticks across the yard. I know that more cold weather is on the way; it's only January. But every day brings a little more daylight and moves us one more step closer to spring. Vivement le printemps! Travailler Plus Pour... Quoi ? When French President Nicolas Sarkozy began bandying about his slogan, "Travailler plus pour gagner plus," which means work more to earn more, something about the whole thing just didn't sound right to me. 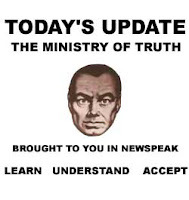 It sounded almost like Newspeak from Orwell's 1984. Ostensibly, Sarkozy wants people to be able to earn more income. His proposal is to modify the thirty-five hour work week restriction. Instead of getting comp time for extra hours worked, people could get paid for it. According to Sarkozy, working longer is the best way for people to earn more money. It's good for you, it's good for the republic. Work more! Earn more! The president noted that his plan would be good for employers, too (it's no secret that Sarko is a pro-business capitalist). If existing employees can work longer hours, companies don't have to hire more people to do the same amount of work (and pay their social security taxes and unemployment taxes, etc.). Under the government's proposal, employers would be exempted from paying the "charges" on work beyond 35 hours and employees wouldn't be taxed on that extra income. But the proposal is not as simple as it sounds. It amounts to a de facto tax cut in a nation facing a serious deficit problem. The labor unions are worried about the future of the 35 hour work week. Cashing in accrued comp time could represent a serious financial liability for employers. There are many questions that still need answering. It will be interesting to watch the debate continue. All that aside, there's something about this "work more to earn more" slogan that rubs me the wrong way. I couldn't actually put my finger on it until I read PZ Myers' recent post on his blog, Pharyngula. It pretty much gets to how I feel about this. I'll quote part of it here (follow the link to read it in it's original form). Once upon a time, we had this thing called the 40 hour work week — the idea was that it was good for the middle class to be able to get a living wage from a reasonable amount of effort. Now we've got Republicans handing out corporate welfare and getting excited because the working class has to labor for longer hours in order to make ends meet. ...I remember a few rough years when my father had to work two jobs, a day job reading water meters for the city and then doing custodial work in the evenings. It wasn't because this was a fantastic opportunity to achieve prosperity — it was because he was desperate to pay the rent and keep food on the table. When people are having to work harder, it's not a sign that the middle class is thriving (emphasis added). I suppose that greed has been a primary motivator of us humans throughout our history. Once in a while we try to get a handle on it. We never do. We're not good at sharing. We don't play well with others. I'm not a communist. I believe that smart and hard-working people deserve the rewards of their labors. But too many smart and hard-working people are not rewarded. They're just barely getting by. And the unlucky are punished with poverty. Wealth is not the best measure of value. Work more to earn more. The more you spend, the more you save. Trust, but verify. 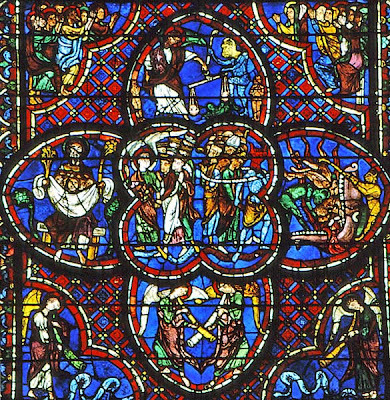 As promised, here are a few shots of the windows in the Cathédrale St.-Etienne at Bourges. 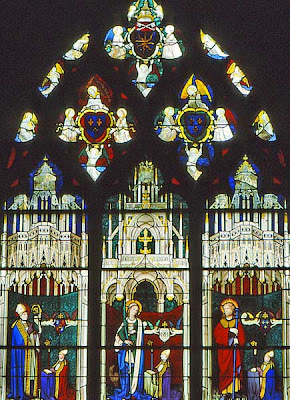 The windows are original and date from the twelfth through the seventeenth centuries. 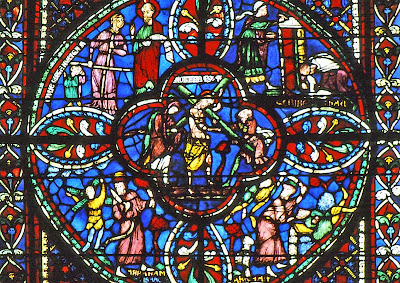 I'm certainly no expert on stained glass or the stories depicted in the windows, but I am always impressed by the scale and intricacy of them. So, here ends the Provence Trip collection. What next? 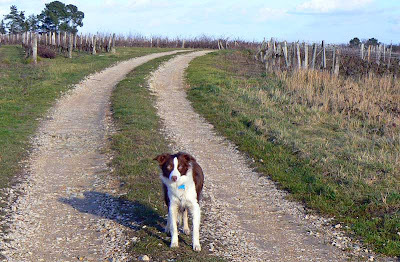 Our trip to Provence came to an end, too soon, of course. 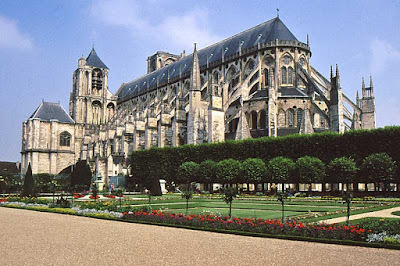 We drove back to Paris and on the way passed through the city of Bourges. Neither one of us knew that there is a spectacular cathedral there. So when we saw it, we stopped to have a look. A long shot of the cathedral from the jardins de l'Archevêché. The Cathédrale Saint-Etienne was built between the twelfth and sixteenth centuries. It's yet another amazing example of gothic architecture. 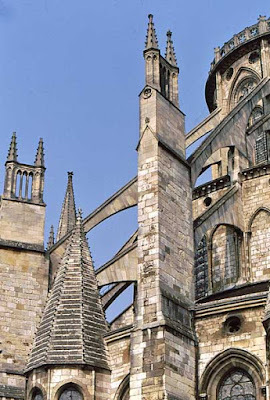 Its flying buttresses rival any I've seen. St.-Etienne is the widest gothic cathedral in France and among the tallest. There is no transept; I think that's unusual for a gothic cathedral. A bit of exterior detail. The gardens outside the cathedral, les jardins de l'Archevêché, are quite impressive with their beautifully tended parterres. Inside, the stained glass windows are spectacular. I'll post some images of those next time. 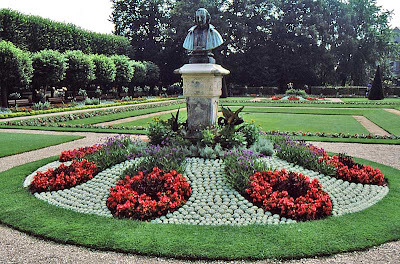 One of the parterres in the cathedral gardens. And now we live within an hour's drive of this place. The city is the geographic center of France, the heart of the historic Berry region, and is the préfecture of the département du Cher, with a population of about 73,000 Berruyers. Buttresses and pillars transfer the building's load to the ground. I know we'll go back before too long to see it again. 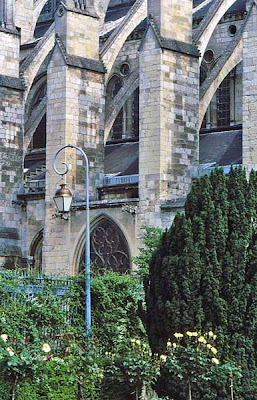 Bourges has a rich history in addition to its cathedral, so there should be plenty to see. Puppy Pic of the Week has run its course. But that doesn't mean that there won't be plenty of photos of Callie around here. Welcome to Periodic Puppy Pics! Callie has a pensive moment. The orange orb in the sky has been making more frequent appearances here in the Cher valley of late. I can tell the days are lengthening, and the daffodils have poked up through the winter soil. Flowers are a long way off yet, but it sure does lift the spirits to see things growing again. 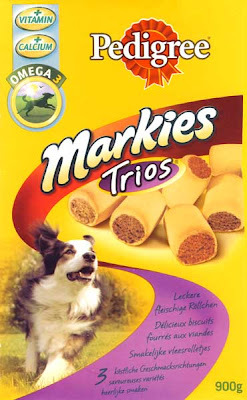 These are among Callie's favorite treats. Does the dog on the box look familiar? This flowering shrub is the bane of many an allergy sufferer. 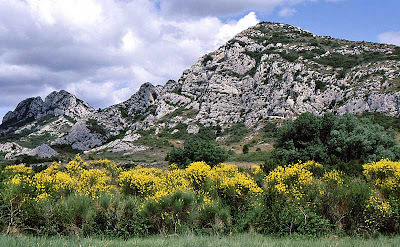 Le genêt, or Scotch Broom, is plentiful in Provence. 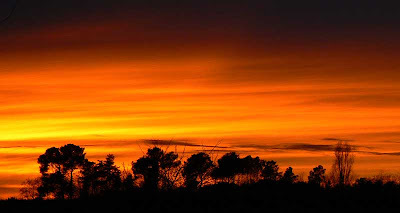 It also abounds on the Atlantic coast of France and in Spain. Somewhere in Provence, plenty of genêt. There are even a few places around us in the Touraine where some genêt grows. It's pretty, but if you suffer from allergies you probably don't think so. 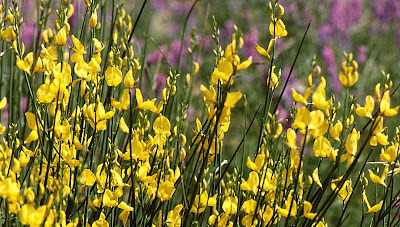 A close-up of Scotch Broom. According to legend, Geoffroy V, count of Anjou and Maine (1113-1128-1151*) was out riding his horse near le Mans one day and came upon a unicorn with the head of a woman in a field of blooming genêt. He was so moved by this vision that he ordered that scotch broom be planted all around his lands. This is the origin of the name of his successors: Plante à genêt, Plantagenet. The most famous of the Plantagenets was, of course, Henry II, king of England (1133-1151-1189). 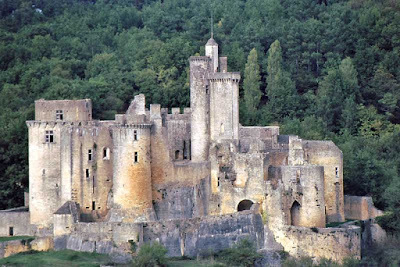 Henry II was fond of the Château de Chinon here in the Loire Valley and spent a lot of his time there. He and his wife, Eleanor of Aquitaine, are buried in nearby Fontevraud, as is their famous son, Richard Cœur de Lion (Richard the Lionhearted, 1157-1189-1199). Another of their sons, Jean sans Terre (John Lackland, 1156-1199-1216), took the court back to England when he became king and subsequently lost the lands in Normandy, Anjou, Poitou, and the Maine to the French. *The dates denote: birth-ascension to the throne-death. 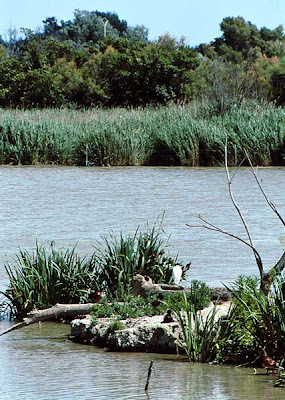 La Camargue is the salt marsh landscape of the Rhône River delta on the Mediterranean. It was designated a National Preserve in 1928 and a Regional Natural Park in 1970. The marsh is a stopover for myriad migratory birds and home to many other water birds. A water bird wades through the marsh. It's a beautiful environment, if not a little harsh, and is criss-crossed with trails for hiking. Agriculture, livestock, and salt production share the land with recreation and nature. We weren't prepared for any rigorous hiking, so driving and parking for quick looks was all we were able to do. I only caught the back end of some kind of heron in this shot. These birds are not the cooperative posers they ought to be. As always, we didn't spend much time there before moving on to the next destination on our trip. We had driven through the Camargue back in 1989 so this was our second peek. 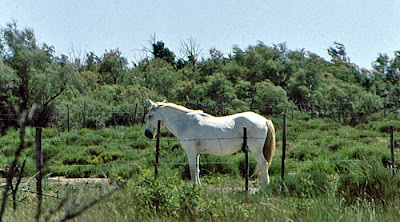 Horses are a common sight in the Camargue. What is it with tea? I live in France, but I drink English tea every morning. The tea thing started back in Washington, DC. Ken drank tea and I picked up the habit. The English tea thing started later, in San Francisco, when we discovered PG Tips. In the nifty pyramid bag! I'm not a fanatic. The tea thing goes in cycles. I've had whole years without tea, only coffee. I don't buy exotic teas. I don't buy loose tea. Just these everyday supermarket tea bags from England called PG Tips. These days, most mornings in our house begin with a pot of PG Tips. Sometimes one of us will make a pot of coffee, but that's the exception and not the rule. I don't do elevensies. I don't take tea at four o'clock. I don't eat crumpets (not that I wouldn't). I like my tea like I like my coffee: black. No sugar, no milk. Just tea. Two cups a day. In the morning. I used to put a lump of sugar in my tea but no more. I also went through a honey stage. But now it's just black. I can actually taste the tea and I like it. 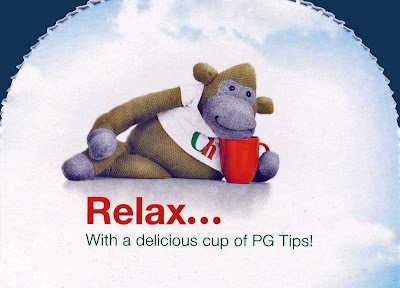 Do you get PG Tips where you live? In Australia? In Hong Kong? In Canada? In South Africa? We find it in some stores here in the French countryside. There are enough English people living in and visiting the region that our stores have a few shelves of British food items. Including PG Tips tea. We made a quick swing through Arles while we were in Provence. 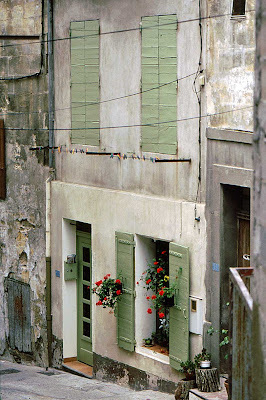 If you remember, we also visited Arles during our Southwest France Trip in 1989. 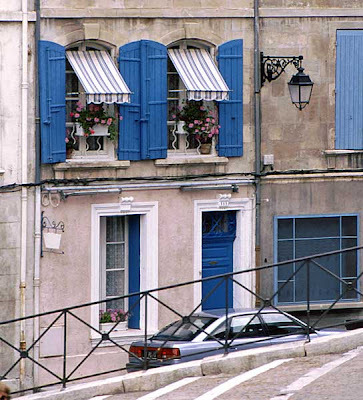 Window boxes, awnings, and blue shutters. The colors in Arles are amazing. I wish I had more time to spend in some of the places we saw so that I could really reflect their nature with the camera. Instead, I just have these few quick snapshots that are nothing more than first impressions. 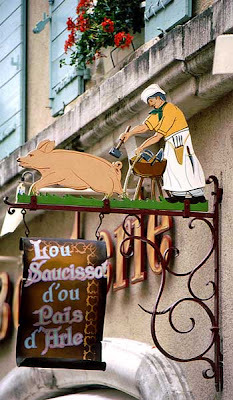 The sign outside a charcuterie. But these first impressions still stir vivid memories in me of the places we visited and the whole of the trip, and that's a good thing. One of my favorite shades of green. I know that I'll go back to some of these places one day. But they and I will have changed from those days when I got my first impressions. I think this lion is keeping out the evil spirits. Here are the two fèves that were inside our first two galettes of the year. Pastry inside pastry. Quelle idée! I don't know if they are cartoon characters or what. 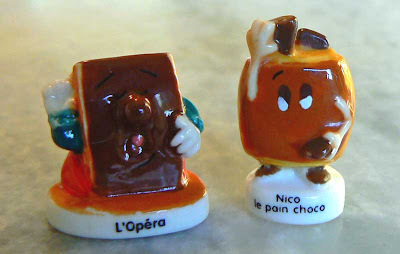 The guy on the left is a chocolate covered cake called a gâteau opéra (looks like he might be singing an aria), and the guy on the right is a pain au chocolat named Nico. Are they familiar to any of you? 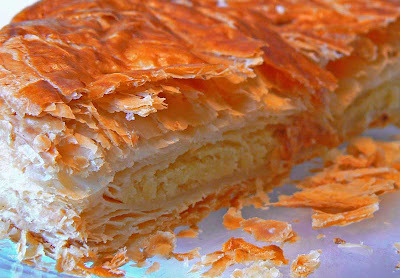 I found out that the gâteau opéra was invented in the 1960s by the famous French patissier Gaston Lenôtre. It's made with layers of biscuit Joconde (made from almonds), coffee flavored butter cream, and chocolate ganache. Sounds good to me! And you thought the holidays were over? Ha! The first Sunday after the first day of January is the epiphany for Catholics, the day they realize how silly the pope looks in those hats. Or something like that. 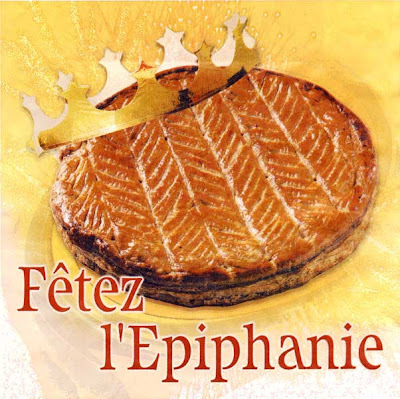 For French Catholics, it's the time of year to eat galettes des rois, a tarte made from pâte feuilletée (puff pastry) and filled with frangipane (almond paste). All the bakeries make several sizes and varieties of the galette, and people (like us) will often buy several over the course of a couple weeks. The galette comes in a special bag for heating it up in the oven. There is small print on the bag that warns you to take the paper crown out before putting the bag in the oven. 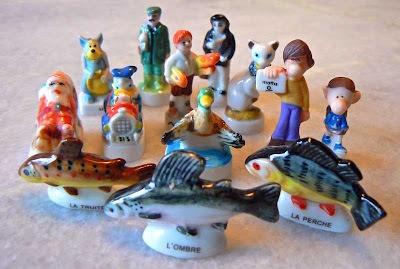 Hidden inside the galette is what's called a fève (literally: bean) that is typically a small ceramic or plastic figurine. Tradition holds that revelers gather 'round the table when it's time to cut the galette. 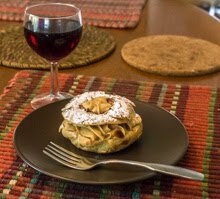 The youngest member of the group gets under the table while the tarte is cut and he or she decides who gets which piece. This avoids any hanky-panky in determining who gets the piece with the fève inside. Our small, and not particularly special, collection of fèves from past galettes. The lucky person to bite down on the fève wins, and gets a free trip to the dentist. I'm kidding about that part; it's not free. What the winner does get is a paper crown and the joy of being declared King for the Day. Imagine how many kings there are running around France this time of year. In addition to his other regal duties, the king is responsible for getting the next galette. Our first galette of 2008 - not likely to be our last! Now, over the years, some people have carefully cleaned and saved their fèves to the point of building huge collections. These people seek each other out to share and view their collections. There are shows where you can see the series of fèves that represent the kings of France (some missing their heads), or Disney characters, or the original Broadway cast of "Hair." There are proud displays of rare and historic fèves. There are fève fairs where much buying and selling and trading of fèves goes on. And, of course, there is the ever-present news media to provide us with the requisite human interest story on the evening news. The people who engage in all of this are called favophiles and they practice favophilie. Sounds dirty, but it's not. Except for all that frangipane on their fingers. And there is no rest for the weary. As all this winds down and February approaches, we will get out our trusty crêpe pans and mix up the batter for la Chandeleur, another Catholic holiday celebrating the holy pancake. The church in Oppède-le-Vieux seen from the old part of town. 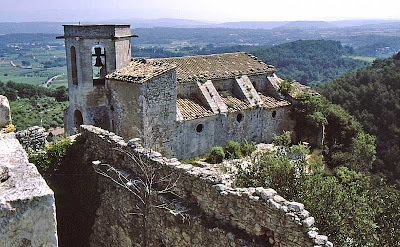 One of the must-see villages on the Luberon circuit (Bonnieux, Lacoste, Ménerbes, etc. 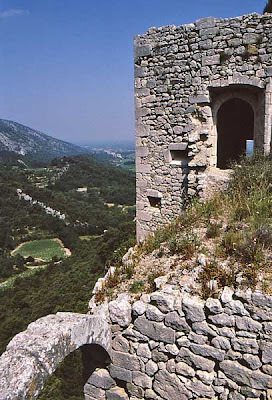 ), Oppède is part inhabited town and part ruins. It's a lot of fun to climb around the old stone ruined buildings, then take a nice break in a small café in the lower part of town. Some of the ruins at Oppède. I think we've been there twice. The first time was on the 1993 trip when these photos were taken. The second time was in 2001 with our friend Sue. 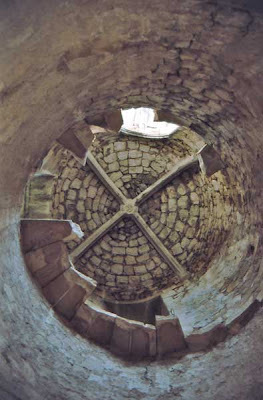 Looking up inside a circular tower. The remains of a broken stair that wound upwards are apparent in this shot. We stopped at a little café in town and had a Pastis. Sue wanted to try it since she'd always heard about it. I don't remember if she liked it or not. I'm not a big fan of Pastis, but I had one anyway. I'm still not a convert.